Create-your-own computer from Dell. Dynamic product suggestions from Amazon. Customized, guided selling for everything from cars to sneakers. This is the Modern Digital Buying Experience – and it starts with Keste. Today’s users demand digital experiences and will only engage companies that are easy to use and provide self-service capabilities. Businesses that have been slow to adapt are now scrambling to create their digital storefront. Legacy applications, the inability to streamline processes, and complex sales are all giant hurdles that many IT departments are struggling to overcome. Keste has proven processes, value-added services, and accelerators for your complete Configure Price Quote (CPQ) needs, including CRM, quoting, order management or supply chain processes to create a seamless customer experience specifically focused on complex CPQ, Service, and Proposals. Our deep subject matter expertise with this technology combined with specific industry knowledge has led to numerous success stories where our customers have increased sales significantly by decreasing the time associated with complex ordering. Offering baseline and reusable configurations, as well as configurable add-ons. As part of our offerings around Configure Price Quote (CPQ), Keste can also extend from core EBS solutions (Configurator for Engineer to Order and Configure to Order, Advanced Pricing and Order Management for complex pricing) to enhance the User Experience with Communities and SOA Integration with industry-specific applications. In addition, our Managed Services team becomes one of your MVP’s that works alongside your team to reach each goal. View a Keste CPQ Case Study here or download one of our CPQ Offerings here. CPQ may stand for “Configure Price Quote” but it encompasses so much more. This powerful software touches every aspect of a business – the what, how, where, and why – making any CPQ project a high-value transformation process full of both opportunities and pitfalls. Here are 5 tips to help you prepare for success. 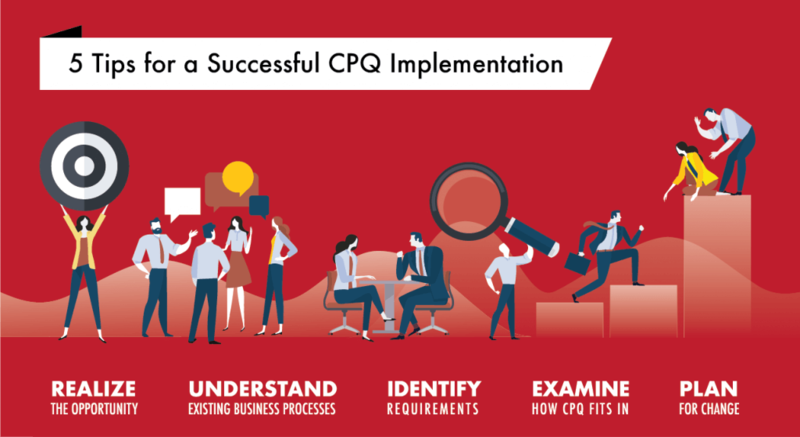 Having already completed the “Five tips for a successful CPQ implementation project” mentioned in the first blog of this series you are well on your way to being prepared for the next step: the actual CPQ implementation. However, what happens when something affects your preparation?